The first thing I noticed was all the cars. Where did all these cars come from? I checked the time. A little after noon. Crap. Lunchtime. Why was the BX parking lot so full? Weren’t we in a recession? How could all these people afford to eat in the food court? Did no one eat at home anymore? Or in their office? I circled the parking lot again. There weren’t even spots in the back. “Who are all these people?” I boomed. I knew this base was busier than the last one I was at. But still. To have no parking spots in the very back was ridiculous. I eventually found a spot in the commissary section. In the very back. Well, technically, it’s been too hot to walk any day. Oklahoma has been over 100 degrees for nearly 30 days now. We hurried over to the BX, walked inside and...almost collided with a bunch of people. There was a line snaked around the BX. In the entrance I could see something set up and a bunch of cameras going off every few seconds. “Must be someone like Burt Reynolds,” I mumbled. I stood on my tip toes to try and get a better look. Maybe it was cast members from The Office. Or…or…The Tudors. Why they’d be on a military base is beyond me but I wouldn’t question their motives. “American Idol,” Tommy said behind me. “You want to go on American Idol? I think you’re too young,” I said, distracted. I was still trying to figure out what was going on. “No. 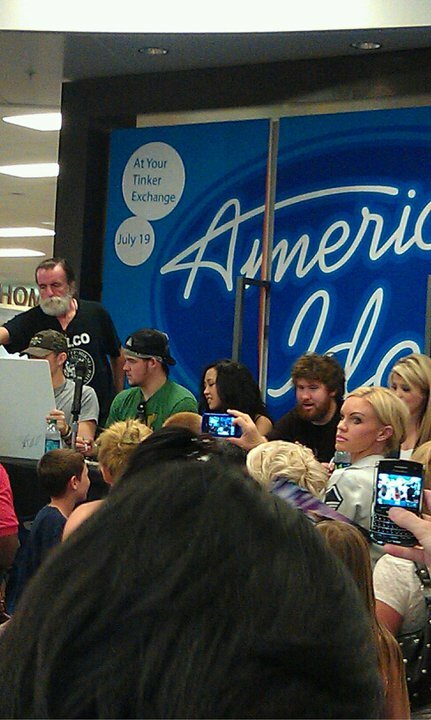 It’s American Idol.” Tommy pointed to the front and I noticed the American Idol sign followed by Meet the American Idols. Or the Top 10 American Idols. Something like that. “Oh.” Then it lifted. Maybe Simon Cowell was here! I love Simon Cowell even though he’d totally make me cry. Then my heart sank again. Simon no longer judged the show. Damn. We were able to squeeze into the BX but seriously, there were people everywhere. Some lady screamed in my ear. Over American Idol contestants. A tween’s elbow went into my cheek as she lifted her cell phone to take a picture. Someone else smelled like BO. “It’s like New York in here,” Tommy said, awestruck. He gazed around the room in astonishment. He’s never been to New York but he’s seen a lot of movies about it. “I don’t like it,” Natalie grumbled. I didn’t either. I would have just turned around and come back the next day. But I needed lawn mower oil. I had to mow our backyard. Tom was supposed to do it before he went back to Korea but the movers didn’t get the mower to us in time. So that left me to deal with it. And because Tom had to drain all the gas and oil, that also left me trying to figure it all out. Have I mentioned I don’t do well with machinery? Which one did I need? The 2 or 4 cycle? Tom didn’t specify. He just said “oil.” And I couldn’t exactly call and ask him which one I needed. I picked up a bottle and pretended I knew what I was doing. Maybe one of the American Idol people knew. I ended up with the 4 cycle oil because it said for lawn mowers on the front. Is that right? I haven’t even tried it yet because it’s been too hot. Really, TOM SHOULD HAVE SPECIFIED. Then I had to go back to the mayhem and buy the oil. The crowd was still crazy. 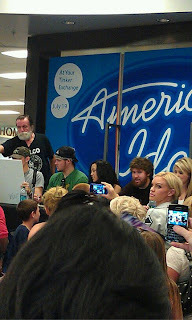 Out of sheer curiosity, I took a picture of the American Idol people. I have no clue who they are. James Durbin is the one with the beard, I think. But I don’t follow the show. I’d have preferred the cast of The Office. Durbin's the one with the hat. I only care because he was the only one I liked this year and of course he didn't win. There's no way I would have gone crazy seeing him, though. The guy with the beard is Casey. And I woulda avoided that crowd like the plague too. Just wondering why in the world the American idols were on a military base in the BX, or whatever. Odd! Glad you survived the mayhem. And, I had to buy oil for the lawnmower the other day too, and had no idea what I was doing. Apparently any oil will do. 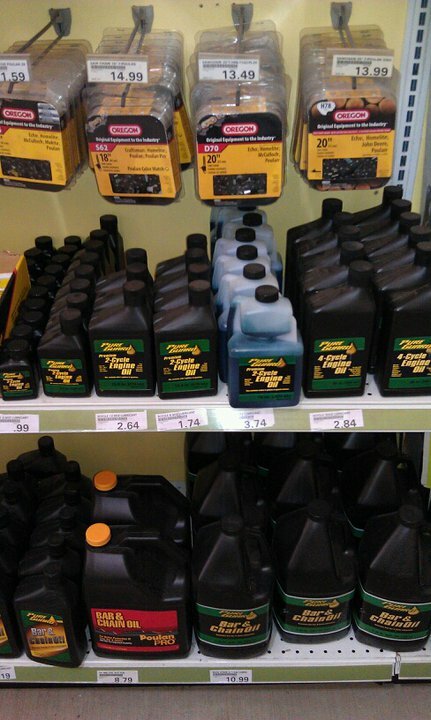 they didn't even HAVE specific lawnmower oil. I would've totally preferred the cast of the office. I think I would faint if I ever got to meet Jim!!! lawn mower oil. i had no idea they made such a thing. Crap; it didn't link. Cut and paste? Sorry Gareth. I would definitely prefer The Office cast (oh John Krasinski, so cute!) to American Idol. I give you a ton of credit for even knowing the mower needed oil - I had no idea - let alone going out and buying it! I would have turned my car around and took off regardless of what I needed. I hate crowds like that. People get so stupid in a crowd. OMG, you deserve a medal for that one! If you have to normally mix your gas and oil before putting it in the mower, than you use 2 cycle. If it goes in seperate places, than you need 4 cycle. Usually. Unless the mower has an auto-mixer. But it should say on the mower somewhere (usually where it says what HP the motor is) if its 2 or 4 cycle. As for 4 cycle, its usually just 30 weight, unlike car oil that comes in 5w-30, 10w-30, etc. And Casey is the one with the beard. Men really never mention the other parts of put gas here, oil here when there are fourteen choices of oil. I get that all the time. Can't you just hire a gardener, and forget about oil and gas altogether? It's the reasonable solution. I agree with Ed totally - If your mower is "newer" it is 4-cycle anyway (it pollutes less). I avoid the hype and insanity of American Idol like the plague. heehee, you TOTALLY should have tried out for a spot in Vegas. You'd have rocked it! See, this is why men do the mowing...they make all those different oils just for a lawnmower?!? I think I'd prefer a root canal to having to walk into that AI mess and then get all confounded over the oil. I guess I shouldn't admit that I saw every single episode last season.. I could name all the contestants in the picture haha. I think it is SO cool you got to see them =] Any who.. They have 2 cycle and 4 cycle lawnmowers?! I would be in the same boat as you with trying to buy the oil. Send some of your heat to Washington, we need and WANT it! Good luck with the lawn mower! I would have found it mildly annoying as well. Would've rather seen Burt Reynolds. I don't do crowds - it could have been Elvis singing duets with Michael Jackson and I still would have kept on driving! @Kristy I would rather have seen Burt Reynolds too. LOL. I've never really watched American Idol (I watched a few of the funny audition clips of people making fools of themselves), so I wouldn't have recognized anyone. The Office cast would've been much more exciting, for sure. At least you got oil! And I'm not 100% positive, but I'm fairly certain that variety should work. Yes, that is the right oil. But seriously, you should have been there with me when I was trying to find an oil filter for my lawnmower last year. I don't watch American Idol either. I think it's lame. If you got one of the Idols to mow your lawn, now THAT would be worth fighting a crowd to see! Wait, American Idol is still on? Color me surprised. I'm glad they usually go to Dallas instead of Fort Worth or Arlington, although I've probably jinxed myself into an audition coming to the Parks at Arlington mall at a very inconvenient time simply because I said that and it's in between my university and my house. Then again, I don't know if they'd do one in Oklahoma AND in Texas. I hate crowds. I'd go home and say *feck mowing the lawn, the kids can learn to do it* or have a neighbor kid or someone do it for me. I don't know anything about lawn mowers. I told my sister I was going to disclaim her when she was following the last season of AI after they got down to the finalists. I think it's because they were so young. It was all I heard about for a few months. I wanted to drop kick her. She didn't understand my dislike for it. The first American Idol went to high school a few miles from here. That was the only time I ever really watched, the first go-around. After that, it became suckage. I admit that Idol is my dirty little secret addiction (hanging my head in shame). Loved James Durbin this year...he's going to go far even without winning. My daughter loves Scotty McCreery so I'm guessing we'd have been standing in the line if we'd been there.